I posted here on an upcoming national activist "teach-in" on "Debt, Austerity and Corporate Greed" being organized by Democratic Socialists of America leaders Frances Fox Piven and Cornel West. Now we learn that three other prominent activists will join the "teach-in." Jeffrey Sachs - One of the most dangerous socialists on the world stage. Sachs is Director of the UN Millennium Project and is Special Advisor to United Nations Secretary General Kofi Annan. He is also the Director of The Earth Institute at Columbia University. 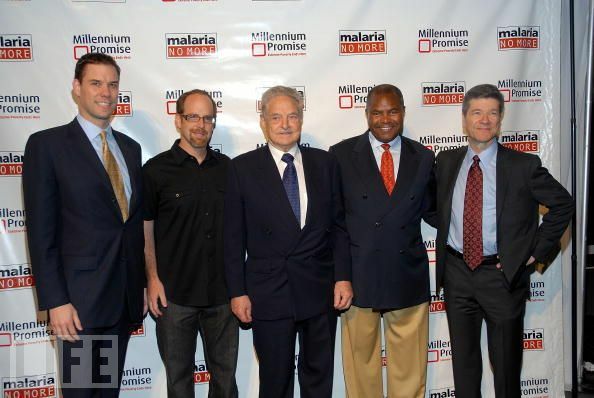 Sachs is a long time beneficiary of funding from George Soros controlled organizations. Sachs addresses the Party of European Socialists in Prague , Czech Republic , 6-7 December 2009, calling for higher taxes in the U.S. and worldwide re-distribution of wealth. Heather McGhee - Washington office chief of Demos,a radical New York "think" closely tied to Democratic Socialists of America and the far left Institute for Policy Studies. Barack Obama was a founding board member of Demos in the early 2000s, while Obama's one time "Green Jobs Czar" and "former" communist Van Jones served on the board of Demos a few years later. Richard Trumka, President of the left dominated AFL-CIO and a long time affiliate of Democratic Socialists of America. Poul Rasmussen, leader of the Party of European Socialists and co-chair of the Global Progressive Forum has described Trumka as "one of the most progressive people in the United States of America"
Five of the most influential socialists in the country, are inciting thousands of young college age activists to take to the streets of America. What I don't understand is how anyone can look at world history and actually belive socialism will work. It seems they think it will be different for their generation because they are so compassionate ("unlike capitalists") and their socialist leaders will do everything out of compassion. I also see that many younger people feel entitled to so many things without working for anything, and they think it will be handed to them by the govt. These people are using the younger generation (and some older folks who should know better)to their own end. Their real and unspoken goal is power- they want it. We can not let them win! It is time for another HUAC! Thanks very much for that list stang289. Will be KeyWiki'ing it tomorrow. Thank you, Trevor. I'll be watching. I've sent this to the FBI 3 times. The site never would let me log in. I downloaded the program. I kept getting a message that "User limit has been exceeded." Oh, well. Will wait for the video.